Bristol County Sheriff Thomas Hodgson spoke at a public hearing on Friday. 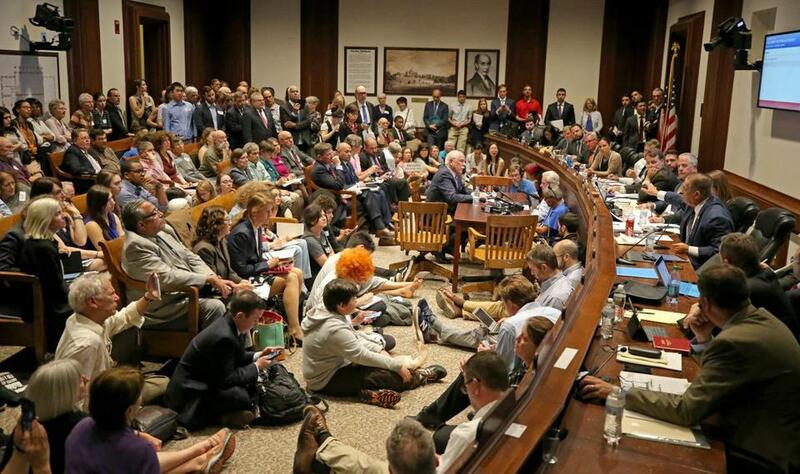 The hearingfocused on a controversial immigration bill, called the Safe Communities Act, which has become a flashpoint in the statewide debate over whether Massachusetts should become a sanctuary for undocumented immigrants. If passed, the Safe Communities Act would prevent local and state law enforcement officials from arresting people based on their immigration status, holding immigrants to comply with detainers from US Immigration and Customs Enforcement, and deputizing officers to serve as immigration agents. The legislation would also bar Massachusetts agencies from sharing information with any federal program creating such a registry, in response to President Trump’s calls during his campaign for a federal registry of Muslims. The bill, sponsored by state Senator James Eldridge and state Representative Juana Matias, is an updated version of a bill Eldridge has brought before the committee several times in recent years. Among the dozens of speakers at Friday’s contentious hearing — which lasted more than seven hours — were several immigrants who gave impassioned defenses of the bill. And an 11-year-old boy who attends school in Brighton spoke about his 3-year-old sister and his terror over the prospect that his parents might get deported. “I sometimes fear that if this act didn’t pass, my parents might get taken away and my sister might not remember them when we grow up,” the boy said. Ninety-three state lawmakers have signed on as cosponsors of the bill, and according to the Massachusetts Immigrant and Refugee Advocacy Center, more than 100 nonprofits and community organizations have endorsed it. Testimonials at the hearing sparked disagreement and questions from what appeared to be a divided legislative committee. 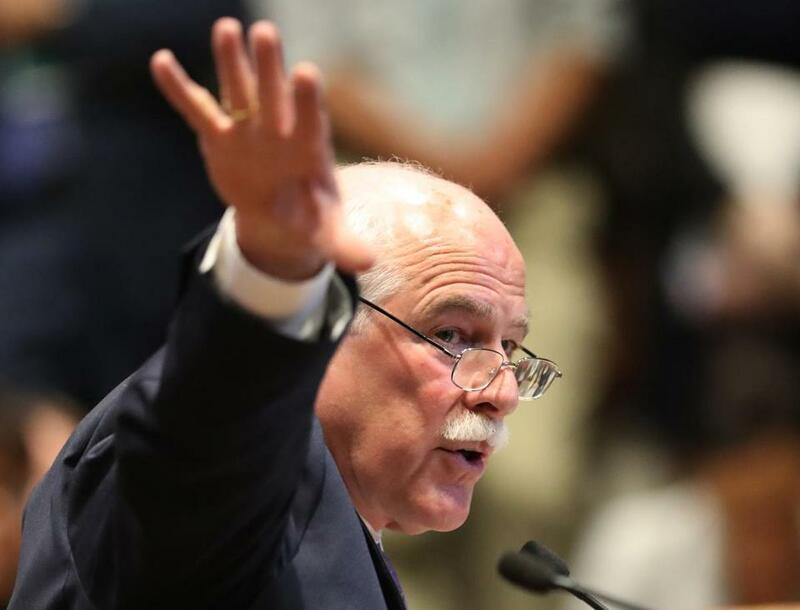 Hodgson argued that undocumented immigrants bring crime to Massachusetts, so sharing information with ICE is essential to preserving public safety in the state. State Representative Joseph McKenna, a Republican, raised concerns that preventing this information-sharing could amount to obstruction of justice. But supporters of the bill argued that without the protections the act offers, undocumented immigrants in Massachusetts are reluctant to go to school, show up to medical appointments, and report crimes such as domestic violence. Bristol County Sheriff Thomas Hodgson. Speaker after speaker in support of the legislation argued that it is essential for undocumented immigrants to trust that local authorities will not seek to deport them if they report a crime. Somerville’s mayor, Joseph Curtatone and its police chief, David Fallon, said the city’s sanctuary status has improved community policing and lowered Somerville’s crime rate. “We have benefited as a community, and as a police department, from our commitment to community policing that happens to engage everyone in our community, regardless of immigration status,” Fallon said. Alejandra St. Guillen, director of immigration advancement for Mayor Martin J. Walsh of Boston, gave similar testimony in support of the bill on Walsh’s behalf. Religious groups, organizations advocating for survivors of domestic violence, doctors, and lawyers also testified in support of the act. Although its supporters outnumbered opponents at Friday’s hearing, the bill faces an uphill battle in the Legislature. Members of the legislative committee would need to report the bill out of committee before it can come up for a vote, and associations of the bill with the term “sanctuary” may prove to be an obstacle in getting it passed. Speaker of the House Robert DeLeo tabled a different immigration bill this week on the grounds that it could be construed as “sanctuary state” legislation. Even if the bill reaches and passes the Legislature, it will probably face a Baker veto. As more cities, states, and college campuses across the country have adopted the “sanctuary” designation in the wake of Trump’s election — and the administration has threatened to cut federal funding from localities that do so — the term has become increasingly politically fraught. The sponsors of the Safe Communities Act, as well as representatives from the ACLU and Massachusetts Immigrant and Refugee Advocacy Coalition, repeatedly said the bill complies with federal law and would not officially designate Massachusetts a “sanctuary state,”a framing they argue would safeguard federal funding for the state. But Baker rejected the bill in a statement Friday, applying that “sanctuary state” label to the legislation and arguing that it would make Massachusetts less safe. “The safety and security of our communities is a top priority for our administration, and I oppose this bill that would prohibit law enforcement from enforcing bipartisan policies that have been in place for 10 years and prevented violent and dangerous convicted criminals from being released back onto our streets,” the statement read.